Spend time in the same room as your new cat and let him or her slowly come to you. Do not rush the relationship. Cats and kittens need a lot of time to acclimate to you and their new home. Speak in soft, kind, gentle tones and keep the house quiet. Don't overwhelm your new cat with a lot of family and friends until he or she is adjusted to your household. Always supervise small children with the cat. Instruct them to be respectful and gentle and calm. 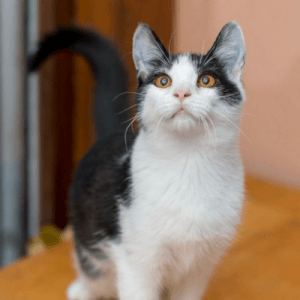 If you are introducing your new cat or kitten to animals you already have in the home, be sure to follow introduction procedures explained to you by your Placement Team volunteer. Introducing your new cat to your other animals improperly and too soon may result in an aggressive and unfriendly relationship among the animals. POA Placement Team members are experienced in animal introduction procedures and will give you information for you to take home, and clear instructions for you to follow.